Gandy Digital Fascin8tor FESPA 2016 is to be the Launchpad for Canadian based Gandy Digital for its Fascin8tor 5m roll-to-roll printer. Gandy says that it delivers large format prints with very low ink consumption, without compromising print quality and regardless of speed. The company believes it will allow customers to increase productivity, extend their application portfolio and maximise job profitability. Advanced Blade Technology is the process that combines eight Ricoh Gen4 print heads per colour to produce optimum print resolution. In addition, Fascin8tor uses fixed dot printing to ensure cost-effective, yet very high print quality in all printing modes and speeds. This results in lower ink consumption per square metre as a result of printing with small fixed, high density ink dots. 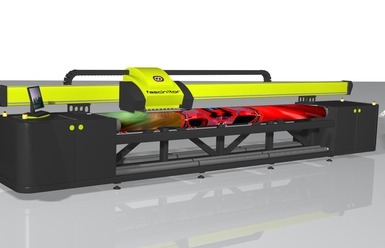 Gandy will also showcase other printers at FESPA, to include Gandy Digital Softjet, Gandy Digital Sl8te and Gandy Digital Termin8tor.